Complimentary Education Matching Service CollegeComplete.com continues to expand its website to include information for those looking to become automobile mechanics. Complimentary higher education matching service CollegeComplete.com (877-543-2655) today announced that it now includes crucial information for those looking to find employment as a mechanic. Those looking to enter this workforce can now go to http://www.collegecomplete.com/automotive-service-technicians-and-mechanics and see government statistics about education needs, job growth and salary. The number of jobs for automotive service technicians and mechanics is projected to grow slower than the average for all occupations for those without proper training. Opportunities should be good for those who complete postsecondary automotive training programs, as some employers report difficulty finding workers with the right skills; those without formal automotive training are likely to face competition for entry-level jobs. The Bureau of Labor and Statistics has shown that this is an employment area where education is a key factor in success and ability to find work. It is the goal of College Complete to highlight these areas where increased education can lead to increased employment. Knowing that an informed applicant has a greater probability to graduate and move on to gainful employment down the road, the expansion of the CollegeComplete.com website continues the goals set forth by its founders Dan Haim and Jason Shatzkamer, to get as much information as possible in the public’s hands so that they can make informed decisions. People can contact your personal Education Advocate by filling out an information request form on CollegeComplete.com or by calling 877-543-2655. They are available Monday through Thursday from 10am through 7pm and Friday 10am through 4:30PM. Their assistance is available at no cost to you and requires no future obligation. Education Advocates are there for the public to provide information and assist potential students in identifying the best schools to achieve their goals. 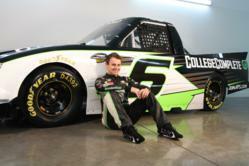 College Complete is actively looking to reach out to the public about their free service through sponsorship of Justin Lofton, driver of the Number 6 Chevrolet Silverado owned by Eddie Sharp Racing, in the NASCAR Camping World Truck Series. They will also be sponsoring Justin Lofton next weekend in his off-road race in Las Vegas.